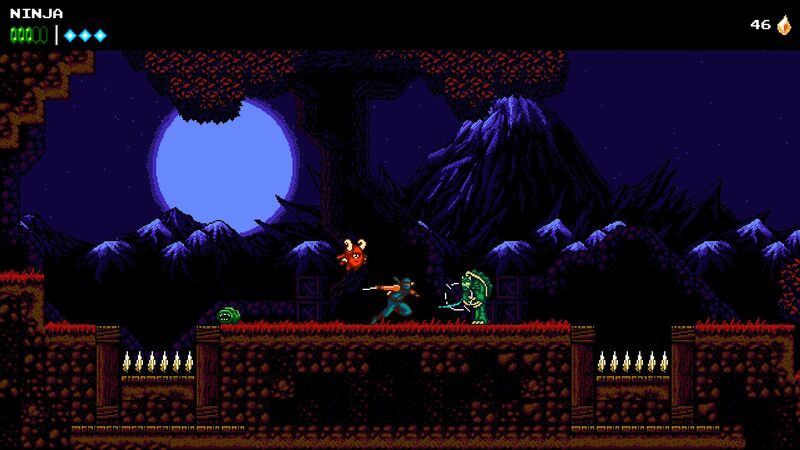 The Messenger is a love letter to 8-bit and 16-bit games like Ninja Gaiden and Metroidvania titles. The game has pulled in several awards at the Ubisoft Indie Series and the Montreal Independent Games Festival. Developed by Quebec City, Canada-based developers Sabotage, The Messenger features two distinct visual styles, character upgrades, a comedic plot, and a chiptune soundtrack by Rainbowdragoneyes. Our protagonist is likely the biggest slacker in a clan of ninjas. He rarely shows up to training sessions and harbours doubts about the existence of the prophesized hero from the west. Much to the shock of his teachers, the hero of the west chooses our protagonist to be the messenger who will carry the scroll that will save the clan. The Messenger is actually more comedy than drama. It isn’t the most gripping story, but its light-hearted nature is a great counterpoint to The Messenger’s challenging gameplay. The writers pay tribute to famed retro platformers, break the fourth wall, and generally have a lot of fun with the platformer genre. There are moments where the humour is a little random, but it’s generally good enough to elicit a smile at bare minimum. The Messenger does an excellent job channeling the retro platformers that inspired the game. Controls and level design are almost spot on. The controls are incredibly responsive. Skilled players will be able to chain together some YouTube worthy moves to rocket through levels due to the smooth controls. The only downside is the game is designed almost exclusively for use with a controller, as the mouse and keyboard seem to be an afterthought. There are no options available for adjusting keybinds, let alone a list of what each key actually does. The level design is excellent. 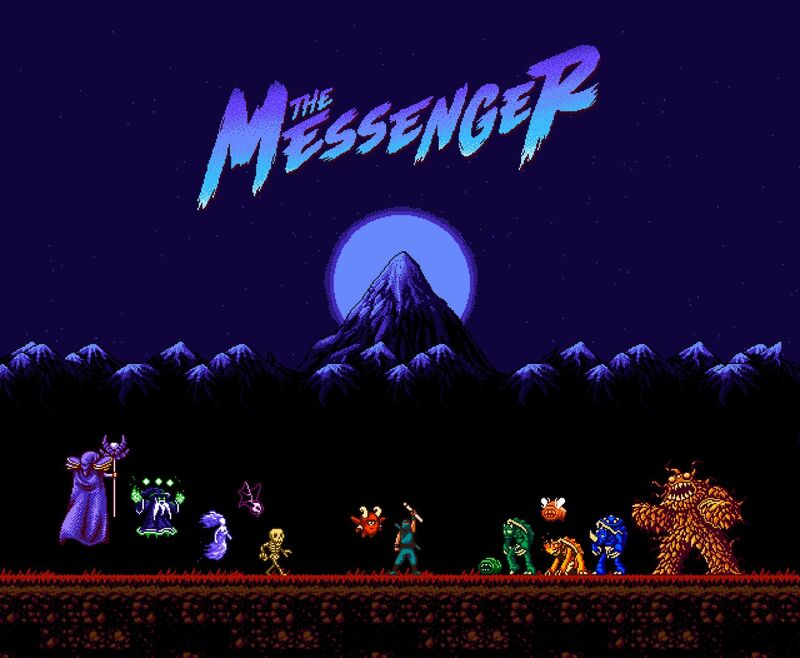 The Messenger starts out as a pretty simple 8-bit platformer, but the game becomes increasingly complex as new equipment and mechanics for maneuvering around the levels are introduced. Sabotage does an excellent job of catering to players of all skill levels. There are plenty of side paths, secret areas, and shortcuts with more difficult layouts to test the skill of veteran platformers. At the same time, there is usually an easier path for newbies that will skip a bit of currency or take a little longer to complete. The boss fights are well made. The fights offer some interesting mechanics, and many have more than one way to attack weak spots. 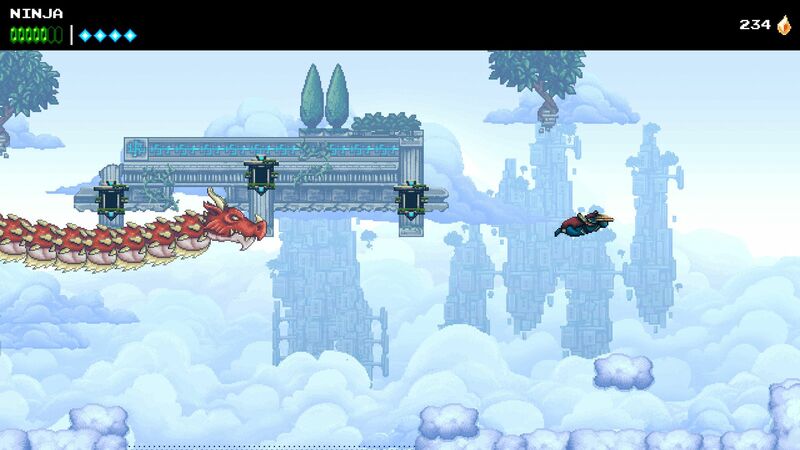 The Messenger offers a good amount of variation in these fights, ranging from large scale set pieces to high mobility brawls with fast moving bosses. Some boss fight intros need to be shortened though. While retrying bosses after death will skip over any conversation, many bosses have a long introductory animation that gets frustrating after watching it for the twentieth time. The character upgrade system isn’t the deepest, but it provides a few new abilities that makes the game significantly easier. There’s plenty of room for the truly masochistic to attempt to beat the game without any upgrades. I like how The Messenger handles currency and death. Upon returning to the last checkpoint, the level repopulates all the currency, but players will lose a set number of currency as punishment for dying. The penalty is generally lower than the amount of currency that respawns, meaning struggling players will eventually get a leg up. The character upgrades are capped; however, making the overall learning curve a slow, consistent trend upwards. 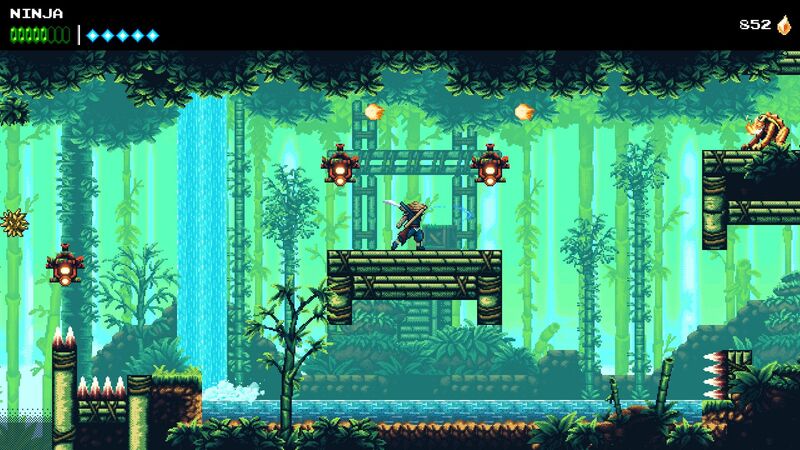 The Messenger offers two visual styles, one replicating the 8-bit era and the other 16-bit. The artists have done a fantastic job as the styles are pretty much spot on. The transition between 8-bit and 16-bit is handled well. It’s cool to see how different, yet similar the game looks using 8-bit and 16-bit graphics. The sprites are animated well. While the enemies feel more like riffs on classic designs, The Messenger offers visually interesting bosses. The Messenger’s audio experience is excellent. The sound effects are perfect replicas of 8-bit and 16-bit sound effects. The chiptune soundtrack from Rainbowdragoneyes is amazing. While the music is heavily influenced by modern dance music versus old school game soundtracks, the music serves as the perfect accompaniment to The Messenger’s slick gameplay and daredevil acrobatics. I’m happy to see the soundtrack has been made available for purchase, because it’s worth a buy on its own for game music fans. The Messenger is a fantastic platformer. The well-crafted levels, tight controls, and excellent presentation comes together to form a satisfying package. As a gamer who is notoriously awful at platformers, I found myself drawn to The Messenger in the same masochistic way gamers have been playing Dark Souls­-type games for the last several years. Even more skilled players will still be able to tune the game to give themselves the sort of challenge they crave. While the game’s mouse and keyboard controls fall short, it’s totally worth plugging in a controller and enjoying The Messenger. 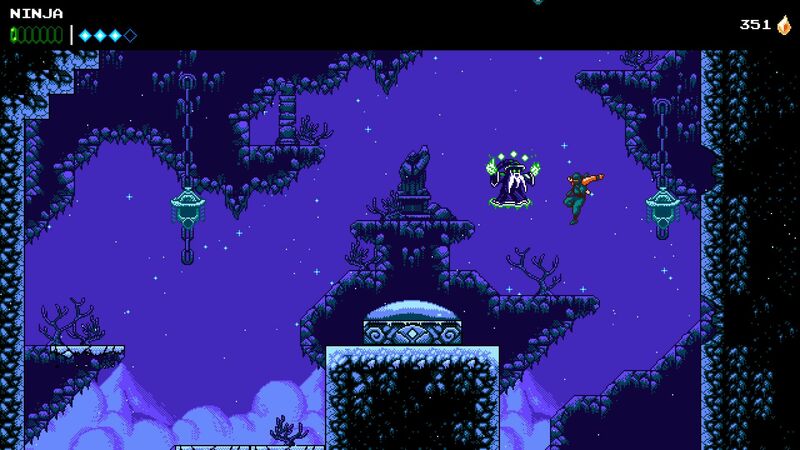 The Messenger is a must play for platformer and retro fans. Just make sure you have a controller.